Cheerleaders and gymnasts looking to stunt like an all-star look no further. Trevor Theismann has put his sports training background to work to improve your flexibility, strength, and power during every performance. Improve your kicks, range of motion, and jump height today with our Cheer Pack. Improve hip flexor strength for higher kicks. 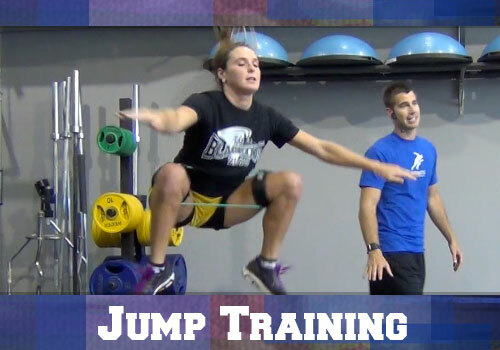 Develop leg strength and power for enhanced jump height and body control. Assisted Range of Motion Stretching. Stretch Sequence Included With JUMP30. Fly like an all star after you move through the jump training segment of Jump30. During each exercise you will feel the difference in how your body performs. Jump higher today with Jump30. With Kbands your stunts will reach a new peak. With lighter feeling legs and improved jump height you will be noticed. As soon as you finish training you will be ready to compete with explosive jumps and kicks. Toe Touches and scorpions have never been so easy with the flexibility you will gain from Trevor's stretch routine. 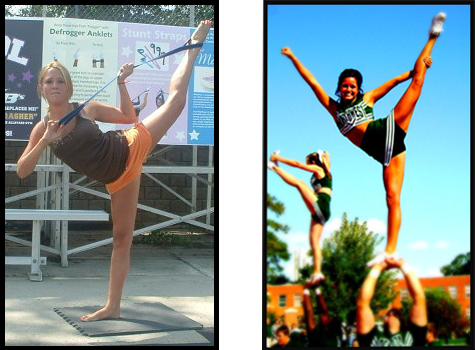 Using your stunt strap you will be able to improve your flexibility in as few as three workouts. Kbands are designed to give you resistance with full range of motion during stunts. Work on your toe touch, hurdler, arabesque, or scale with ease. Simply strap the leg bands on and begin training. Work through resisted reps followed by un-resisted reps and be amazed at how light your legs feel. Every time you use the leg resistance bands you are firing more muscle fibers during the stunt than without. This muscle recruitment will lead to more strength and higher jumps fast. You will feel your legs feeling lighter and going higher than ever before. Kbands are also great for building the leg strength and the core needed for upper level stunting. See what other cheerleaders are saying about the Cheer Pack and get started today. To become a great cheerleader or gymnast it is essential to improve your flexibility and range of motion throughout your lower back, core, and legs. Our Stunt Strap is a great tool that fits comfortably around the foot to support the leg through an array of different stretches for the hamstrings, hips, glutes, quads, and lower back. The key to high jumps is being able to move through full range of motion during each stunt. The stunt strap and Trevor's step by step stretch routine will help give you the flexibility you need to be successful fast. Jump30 is a 30 minute training routine used by cheerleaders of all ages. Jump30 will help improve flexiblity, strength, jump height and stunting. 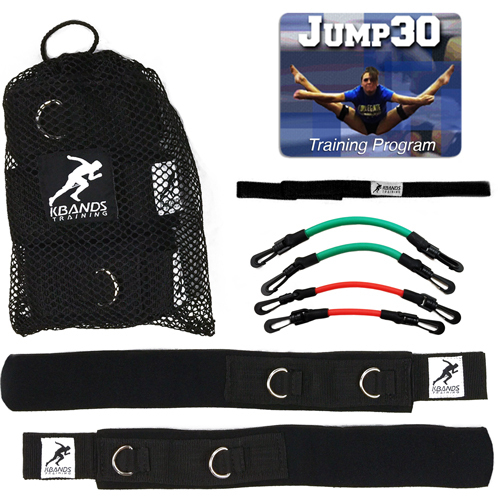 With the Jump30 digital download you can train anywhere. Load the training video to your Smartphone, Tablet, or Laptop today and begin training. 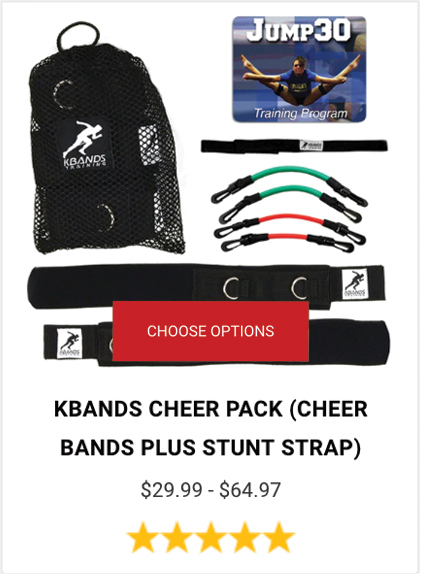 Kbands Training offers fifteen free training routines for every cheerleader and gymnast. Increase your flexibility with our Stunt Strap Stretch Routine, learn how to improve your toe touch and scale with tips from a college cheerleader, and build the leg strength needed to stunt like an all-star with our easy to use Kbands Stunt Training Routines. Each routine will keep you practicing each stunt while increasing your hips and core to perform better. Click one of the links below and begin training after you order your very own Cheer Pack.